(St. Paul, MN) April 1, 2013 – The critically acclaimed AMC cable network series “Mad Men” returns April 7, and MidModMen+friends is taking that as a cue to host an in-store event celebrating the “cocktail culture” of the 1950s and 1960s. MidModMixer is a special sales event April 5 through 7 featuring an extensive selection of vintage glassware, bar accessories, serving pieces and even bar carts – all in a “Mad Men” style. Vintage glassware and bar accessories are a staple at the store, but Kielar explains that for this weekend and the next they will have an unusually large and diverse inventory. “We have some fairly rare pieces, and everything is in ready-to-use condition,” he says. Some of the glassware is trimmed in 22k gold, there are crystal decanters, retro ice buckets and even an ice bowl with pink elephants. There will be bargains, too. The store is inviting customers to create their own set of glassware from a special selection of glasses – all in the same sizes but with different designs. 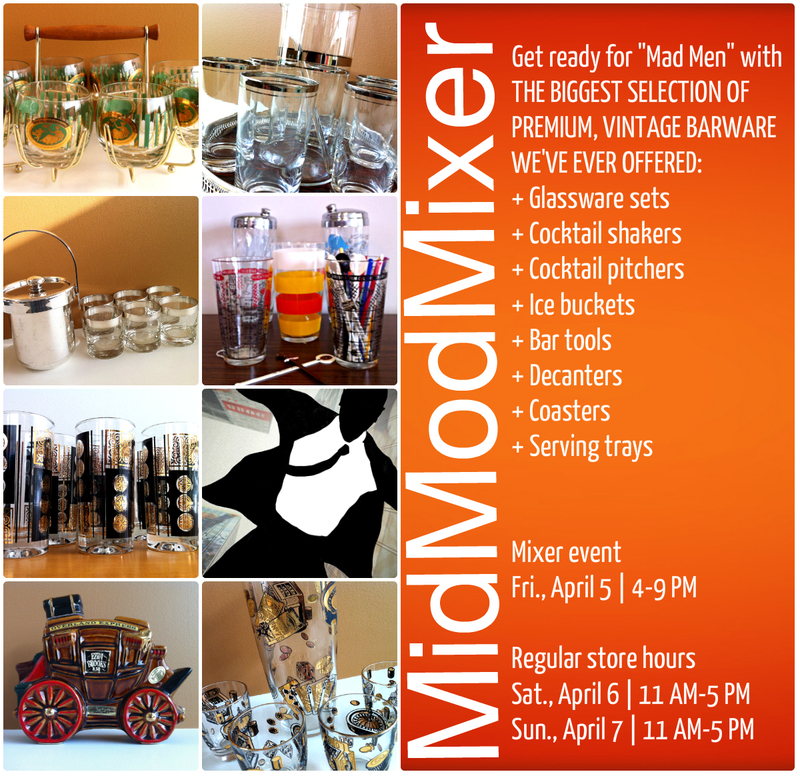 The MidModMixer sales event kicks off Friday, April 5, from 4 to 9 PM, with an open house. It continues Saturday and Sunday with regular store hours of 11 AM to 5 PM. For more information about the event, visit Facebook.com/MidModMen and look at the events link. MidModMen+friends is located at 2401 University Avenue, St. Paul, MN 55114, one-half block west of the Raymond Avenue intersection. The store carries furniture for every room, from Danish teak to pieces designed by some of the most iconic names in mid-century décor.